Doctors and chiropractors have seen more and more CrossFit injuries as CrossFit has become an increasingly popular fitness regimen, sport and training method for athletes, military, police and everyday gym-goers. It is based on an increased work capacity across a variety of different exercises and activities. Specifically, CrossFit involves functional movements performed at high intensity. This exercise/training regimen often includes aspects of weightlifting, gymnastics, running, rowing, and more. Overall, the aim of CrossFit is to forge a broad and inclusive fitness supported by measurable, observable and repeatable results. It is designed to prepare trainees for any physical contingency. While CrossFit challenges the world’s fittest, the program is designed for any committed individual, regardless of experience. 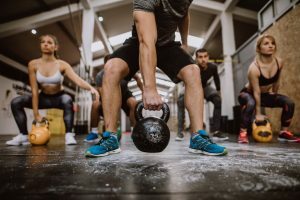 Injuries inevitably occur with any fitness regimen, but CrossFit has come under scrutiny for the perception that it may cause increased injury rates as compared to other methods of training. Although this may not necessarily be true, there are still certain CrossFit injuries that are more common within this community than other exercise routines. Due to the highly repetitive nature of training, many of the most common CrossFit injuries that do occur are repetitive overuse injuries. The rotator cuff is a group of tendons and muscles in the shoulder, which help provide stability to the shoulder joint and assist in rotational movements of the humerus, or upper arm bone. Injuries to the rotator cuff group most often result from repetitive overuse or acute trauma. Since the rotator cuff is a primary stabilizer of the shoulder joint, especially with overhead movements, injury to this group of muscles may lead to impingement syndrome. Most often, impingement syndrome is caused by injury or weakness of the rotator cuff muscles. This results in the inability of the rotator cuff to stabilize the head of the humerus in the shoulder socket when the arm is raised, causing pain and weakness when a muscle tendon is “pinched” in the shoulder. Shoulder injuries such as rotator cuff tendinitis are more common CrossFit injuries due to the high volume of Olympic-style lifts, gymnastics, and other complex movements. Medical epicondylagia, or golfer’s elbow, is an injury to the flexor tendons of the forearm which results in pain and discomfort at the medial, or inside of the elbow. The flexor tendons of the forearm, wrist, and hand originate at the inner elbow and end in the hand. Their function is to flex the wrist, hand, and fingers as well as help with gripping things. This condition earned the name “golfer’s elbow” because of the high repetition of flexing and gripping required. CrossFit involves not only a lot of gripping of various objects (barbells, kettlebells, rings, gymnastics bars, etc. ), but also involves high levels of strength during pressing exercises, which utilizes the strength and endurance of the forearm flexor muscles. This condition typically results in pain, weakness, tightness, and dysfunction in the affected muscles. Repetitive overuse injuries such as medial epicondylagia typically occur when there is either a large amount of force utilized or a high amount of repetitions. In CrossFit, there happens to be a demand for both high repetitions and high force production, making it one of the most common CrossFit injuries to the forearm muscles. Due to the amount of Olympic and powerlifting present in CrossFit, there is a large amount of compressive strain being placed on the spine. This can result in simple mechanical low back pain or slightly more complicated disc herniation. Additionally, CrossFit involves several exercises that place high tension on the spine. Performing exercises such as deadlifts and toes-to-bar at heavy weights or high repetitions can take a toll on the back and sometimes result in injury. Most CrossFit back injuries occur from poor form and lifting mechanics as well as lack of core stability. Tendinitis is the inflammation or irritation of a tendon and is most commonly caused by repetitive overuse, high repetitions and high stress load placed on the muscle. The achilles tendon attaches your calf muscle at the base of the heel. Its job is to plantarflex the foot (push the foot downward). CrossFit involves several exercises that involve this motion with either high repetition or force, such as box jumps, double-unders (jump roping) and sled pushes. Extremely tight calves are often a culprit of achilles tendinitis, along with repetitive overuse and high volume with CrossFit. The patellar tendon your quadriceps (upper leg muscles) at the knee and helps in knee extension. This means that each time a CrossFit athlete performs a squat, deadlift, box jump, wall ball, kettlebell swing, burpee, or almost any other exercise, the quadriceps muscles are being used and the patellar tendon is being placed under high tension. This frequent requirement can result in a repetitive overuse injury. Many of the most common CrossFit injuries can be avoided by sticking to CrossFit’s mantra of “mechanics, consistency, intensity.” The majority of CrossFit injuries, especially those caused by repetitive overuse, can be avoided. Practice proper lifting mechanics, warming up, performing the necessary stability/strengthening exercises and listen to your body. Most CrossFit coaches have excellent advice regarding injury prevention, and at 5280 Cryo & Recovery Clinic, we specialize in working with CrossFit athletes by using specific protocols that are proven to help you stay injury-free while crushing your CrossFit workouts. Cryotherapy is the gold standard for conservative and non-invasive treatment of pain and inflammation to the musculoskeletal system. Injuries to muscles, tendons, and joints can be treated with the proven protocols of Active Release Technique (ART), chiropractic manipulation, instrument-assisted soft tissue mobilization (IASTM), kinesiology taping and specific physical therapy stretching and exercise protocols. All of our treatments have provided excellent results for CrossFit injuries. If you are currently suffering from an injury and would like to schedule an examination and treatment with one of our great doctors, call any of our three locations. Mention this article to receive a special introductory rate of $39 for your initial examination!